Out with my dad overnight and while recovering a bloody nice stag he had a bit of an oppsie and went over a bank with his rifle on his back. He's ok (with a few bruises..) but his old BSA Monarch has seen better days. He brought it when he was a teenager so would like to repair it. He's smashed the trigger guard/mag release catch. 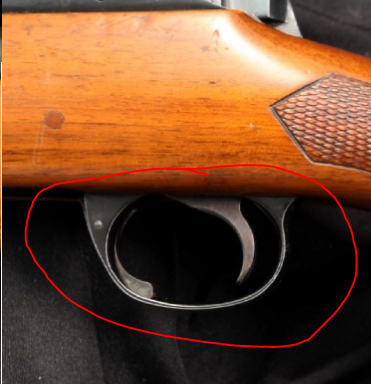 Wanting to either buy just that lower bit of metal, or an entire shot out rifle that we can take parts from. Can you show a pic of what you want, as I have a BSA trigger guard some where here, but it might be off a Hunter ? I will take a picture of the actual rifle tomorrow, but this is the exact thing. Basically the trigger guard and anything else on that same plate. Try sending Gary P on here a personal message....pretty certain he has access to some older rifle parts, so maybe able to help. Got one here you can have free. ANTSMAN, erniec and Husky1600 like this.